If you’ve been keeping track of Nokia’s steady decline over the last few years, then you can tell that the company is moving to renew itself by scrapping its own Symbian operating system and adopt Microsoft’s Windows Phone OS instead. Yet, the two companies have collaborated to bring some of Microsoft’s services, including several Office apps and Lync; Microsoft’s VoIP solution. The roll out of Microsoft’s apps will begin later this year, with a few apps available, and next year with even more apps. In the fourth quarter of 2011, Symbian users should expect Lync; Microsoft’s text, audio and video conversation platform, Office OneNote; which can be used for taking notes on the go, PowerPoint Broadcast; for viewing PowerPoint presentations and Document Connection; which makes it easy to view Office documents stored on the device, as well as on the network using Microsoft SharePoint. 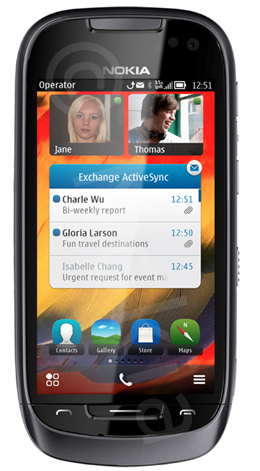 Microsoft® Lync™ 2010 Mobile – for cost efficient IM, presence, audio and web meetings on-the-go. Microsoft® OneNote™ – rich note taking with images. Syncs with Microsoft® SkyDrive®. Microsoft® Document Connection – single view to documents stored on mobile, including email attachments as well as documents on Microsoft® SharePoint® 2010 sites. No screenshots or feature sets for any of the upcoming apps have been disclosed, yet this is the first time that Microsoft has developed a version of Office for a mobile platform other than its own. Better yet, all the software we mentioned above will be rolled out through Symbian’s Software Update feature completely free of charge to all users of the latest version of Symbian, codenamed “Belle”. It’s unclear why Microsoft is putting so much effort into bringing much of its software to a dying platform instead of putting all of its resources into developing software for its own and perhaps other platforms such as iOS or Android. These updates are yet another confirmation that Nokia has not done making investments and introducing innovation into the Symbian platform. […] , we will provide software support to Symbian until at least 2016. Soon, Nokia will begin its transition over to Windows Phone, with devices running the platform which might be introduced as early as later this year. Perhaps this is just the right way to get current users engaged with Microsoft’s new involvement in the once-prosperous handset maker.